Many folks who enjoy the outdoors are not “gun people”…….they recreate in the outdoors but may own only one or two guns. They may own a typical 9mm pistol for personal protection in the home or on the streets, but they do not own a dedicated outdoors handgun that is the typical “woods” gun, such a 454 Casull or a 44 magnum. 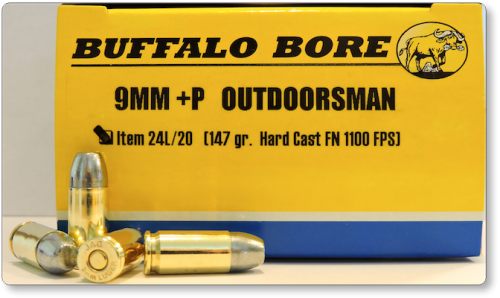 We’ve designed this 9mm load, just for those people who own a 9mm pistol and wish to carry it in the woods for defense against black bears or even grizzly. This ammunition will give them a fighting chance and in keeping with that theme, it may be helpful to read my essay on “Stopping bears with Handgun or Rifle Cartridges”. 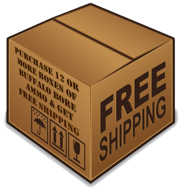 This 9mm load is rated @ +P pressures (not +P+) and as such is safe to use in any/all 9mm chambered pistols that are in normal operating condition. The hard cast bullet (not lead, but hard cast) will not lead foul a functional barrel that is in a normal state of operation, including polygonal barrels, in any make of pistol, including Glock pistols. 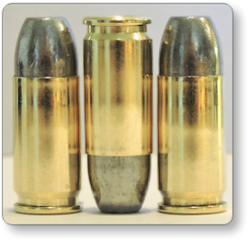 It may be helpful to read my essay on “Hard Cast Bullets in Polygonal barrels”. Many encounters with wild animals and the human criminal element will happen in low light and for that reason, we’ve utilized a flash retarded powder in this load. There is no need to be blinded by your own gunfire at the very moment of need when protecting yourself or loved ones. This load is designed to penetrate deeply (4 to 6 feet) in a straight line, through flesh and bones and that flat nose does considerably more terminal damage, as it crushes its way through tissues, than a round nose bullet does as it slips and slides its way through tissues and that crushing action, keeps the bullet nose forward and ensures very deep straight-line penetration. Round nose bullets tend to get sideways as they slip and slide through tissues and this often causes them to veer off the path. This bullet is designed to crush through a large bear skull, coming and going. While this bullet will over-penetrate humans, even 300+ lb humans, wearing heavy winter coats, there is nothing wrong with using it for defense against humans in situations where over-penetration is not a liability……..sometimes over-penetration is desirable if we need to shoot through car doors, windshields, stick frame walls, or any other softcover, in stopping a threat. As per usual, Buffalo Bore does not believe in the industry-wide duplicitous use of extra-long laboratory test barrels to determine published velocities. These barrels do not give real-world velocities, but always give much higher velocities than stock firearms. Below, see the velocities developed by some of my personal 9MM pistols. All of these pistols cycled/functioned flawlessly with this load and gave anywhere from good to excellent accuracy. ALASKAN GUIDE, PHIL SHOEMAKER, USES 9MM OUTDOORSMAN ROUNDS IN An S&W 3954 TO STOP AN ATTACKING GRIZZLY - See story and photos below. Two days ago I was guiding a couple from NY on a fishing trip and decided to pack my S&W 3954 pistol. When we were approaching the stream we bumped into a large boar who must have been sleeping as we were talking loud just so we wouldn't surprise one. Over the past 33 years I have lived and guided here on the Alaska peninsula I have never had to kill a bear in defense of life but this bear was different. We were in thick brush and I was only 8 or 10 feet from the bear when he started growling and huffing. I began yelling and it eventually ran around, behind my two clients, into the brush. But within 15 seconds it came charging back from the area behind us and popped out of the brush 10 feet from me! I had the little S&W in my hands and was thinking I was probably going to have to shoot it but as it cleared the brush it headed toward my clients. The man had enough sense to grab his wife and fall backward into the tall grass. The bear seemed to lose track of them, even though it was less than 3 feet away from them and it was highly agitated! It then swung toward me, I was 6 or 8 feet away, and I fired the first shot into the area between the head and shoulder. It growled and started wildly thrashing around, still basically on the feet of my clients. My next shot hit it in the shoulder and it began twisting and biting at the hits and I continued firing as fast as I could see vitals. Five shots later it turned into the brush and I hit it again and it twisted and fell 20 feet from us! We hiked out and I flew back to camp to report the incident to F&G and pick up my daughter to go back and skin the bear for F&G. I have the BB for both my M&P 2.0 9mm and my M&P 2.0 45ACP full-size. I'm thinking if the 9mm can kill a bear as mentioned, then my 45ACP with the BB 45ACP 255 grain +P Hardcast FN should be just as good if not better. I feel much better carrying my 45 as a woods gun when it's loaded with Buffalo Bore. I have been shooting this 9mm Outdoorsman ammo for years out of my G17, G19 and G26 without ever having a malfunction. It hits hard and is very accurate. I have shot this load for years out of a stock glock barrel, a KKM barrel and a Lone Wolf barrel. but mostly the stock barrel. I have never seen any lead build up, EVER. I do clean the barrel after every time I shoot them just in case, but just to be clear, there has never been any lead build up in my stock glock barrel or my other aftermarket barrels. I don't have a stronger recoil spring assembly either. I use the plastic RSA the glock comes with. I shoot the cheaper Magtech 147gr FMJFN for a little extra practice and I can't tell the difference in power. both pack a good punch. I can tell you these do not have near the punch as the Penetrator or the P 115gr HPs. Might want to get a tougher spring for those. I have 22lb Gen 3 RSAs with the Gen4 adapter when I shoot those. Those two P loads have never shot consistently out of my G26 so I don't even mess around with them anymore with the G26. Never a malfunction in the G19 & G17 though. Just to be clear, I have never had a malfuntion with the 9mm Outdoorsman in my G26. I am mostly in the woods at parks with my dogs and I also live deep in the woods so this is my primary carry ammo wherever I go. I used to carry different magazines and switch out HPs when in public but that has gotten old and I think the less you mess with them the better when you are riding around. I don't plan on saving the day in some restaurant anyway. but I do want to be able to save my dogs from larger predators if need be. in the Southeast. I have much bigger arsenal for Big Bear country. I just got my second order and first from BB direct. I HIGHLY recommend using this in an extra defense mag should you need to shoot an attacker behind cover. I carry one loaded mag for my Mod. 2's and XDs. Outdoors, I carry the .45 hardcast in my Hi Point pistol and Carbine. I love to test new ammo. Against this hard-cast 147 grain, I selected 147 FMJ FP from Underwood, a hot 124 P FMJ from Fiocchi, A 147 FMJ FP from Doubletap,and a 124 grain P FMJ FP handload. The medium wasn't scientific. Just a pile of newspapers underneath a hard 2 x 12 board. The Buffalo Bore hardcast out-penetrated everything else. It was a solid 1 1/2" deeper than the second place bullet, the Underwood 147. The amount of damage was also much greater. Here's the most important point. Nearly 100% of the bullet was left, WAY AHEAD of the others. It doesn't get any better for woods protection.